A lot going on, and I'm really looking forward to a day of studies, not as escapism but as a way to keep moving and feeling well. Language learning is a source of certitude. I can't control a lot that is going on around me (I can control how I react to it, but that's another discussion), but I can control how my learning evolves. I can make plans and expect to see results. I can feel the outcome of my efforts. It's a rare field where I can see fairness. I don't mean it in a determinist way, on the contrary, there is a lot in the process of learning a language that involves doing your lot and waiting for the changes to take place, for the epiphany or the mere realization you can perform a simple task. There is acceptance involved as well, that something will just take time and it's not necessarily a direct function of hours on task, as hours out of task or on a similar task concur to that result to take place in the end as well. Language learning is not a oasis of serenity; there are conflicts as well, the internal ones being tougher as I've learned long ago not to take what happens online so strongly. Those conflicts are fairly outweighed by the atmosphere provided and the sense of learning through sharing, self-knowledge and self-acceptance. Today's Mandarin reading was without audio, because the current chapter wasn't recorded.It was good for me to realize that I can read Mandarin intensively and understand a good deal from it. It's always tiresome to keep moving the mouse cursor to the side and looking up characters on Pera-pera, but at least I'm making sense of most sentences gramatically now, which wasn't the case before: I'd have trouble understanding even after looking words up. I'm done with watching Kampen for tilværelsen. A good series, challenging language-wise and with som insights on the Norwegian society, irony and humor. I admit I didn't pay attention all the time, and the Polish distracted me especially in the beginning, but I definitely recommend it. Now Side om Sides sesong 6 has priority over any other planned stuff. I'm still in a hurry and spending a lot of time deiling with some issues, and I thought I'd aprehend nothing from today's Berlitz Hebrew lesson, even more so that I didn't study Hebrew at all. It seems it was rather productive, and maybe yesterday's pause actually helped as it gave my brain some rest regarding Hebrew. Almost by miracle, I managed to do Hebrew and Indonesian today. I'm not very happy with either Hebrew resources, and the lack of Clozemaster practice in the past days is doing harm to both languages. The Hebrew resources are about to end, so I'll stick to them and then do only fully transcribed resources again. As for Clozemaster, I really need to get back into the game. For now though, I'm leaving on holidays for the next 10 days. I'm back to studying regularly probably the first Monday after the next one, but I'll keep checking the forum once in a while and trying to do Clozemaster. ...And I'm back! This vacation was really short, and I actually traveled only during the extended holiday around the 15th. We traveled by car on the opposite direction of the holiday rush, on a good road, and we could even enjoy a couple of days at the beach. I did next to no language learning. I struggled to do Clozemaster; most days I actually did the bare minimum for keeping my streak at the upfront languages. I did some side reading but it was less than my daily non-fiction quota. I didn't even finish some translation tasks that required sitting at the desktop, and I had the past week tue-fri for that (I'm waiting for some new developments on the part of the customer, anyway). In the morning, I'd still have to take the girls to the kindergarten at around 8 AM, then I'd go to the gym (which I usually do at 6 AM, so it was the actual rest I was having last week) then I'd work on urging tasks such as taking the car to wash, shopping for groceries or for diapers at Black Friday. On the other hand, I spent really wonderful afternoons with my daughters, and that was the main point behind being the only parent on vacation for the past week. Pity that I couldn't do any of the planned tours, including taking them to know Inhotim - google it, it's worth it - due to the non-stopping rain throughout the week. All this to say that it's extremely hard for me to set a language learning routine when I don't have a routine. On a typical workday I can get a lot done, and only at the busiest days does stuff get dropped. All's well with my dad. I had been living anxious and stressful days already before I left on vacation, and being distant made it worse. Fortunately the disease could be taken care of without aggressive procedures. He has a condition now, and has to finally live a healthier lifestyle. He was supposed to come with my mom on a visit but now I don't know what will be of that, I'll probably have to wait for the next vacation and go there. Another pending task solved during my vacation is that now I have mobile internet. I was staying on an old billing where I paid the same for voice-only, so it was about time. Now I have more options for my hidden moments, Clozemaster for instance. I only hope having internet all the time won't take away listening time. Speaking of which, I signed up for Clozemaster Pro, following the Black Friday offer, 30$ yearly. I did it for the perspective of working on the grammar exercises, which are available even for Norwegian. I still haven't had my issues dealt with, and the idea that those serious bugs might be dealt only with now that I am a pro user is outrageous to say the least. This week and a half where I did little Clozemaster showed me that I'm better off letting go of any gamification frenzi and just focusing on my own learning routine. I started the sixth season of Side om Side. Really like the show. I'm trying to pay attention to the characters' varied accents, as recently I've been bombarded with information on dialects in Norwegian, especially Bergen and Stavanger (which sound alike to me at first thanks to the R, but I know that gramatically they differ a lot). I need to watch Norwegian more intensively, pausing and looking words up, not doing anything else in parallel, if I want to make any sound progress. It's only 10 minutes after all. It helps that I watch Side om Side from NRK's website so no player window to drag to the site while keeping browsing. I'm worried about Modern Greek as it seems my most held back language. Only 8 minutes a day on listening-reading, apart from Clozemaster. Actually I'm seeing some improvement at comprehension and I'm even noticing some verbal forms which I wouldn't have that much trouble incorporating into my active vocabulary, as I'm starting to get the hang of the verbal morphology. Hebrew, on the other hand, is a disaster. I'm learning very little from the lessons, as I can't figure out either translation or pronunciation or both. I'll stick to both resources for the time being, because I've dropped too many resources already. Not knowing how to say words out loud is really an issue, but in a couple of weeks I'm back to the safe harbor Assimil, which I plan to "overlearn" this time, i.e. as much closer as I can get to that. Wondering if I shouldn't use the Goethe-Verlag texts for activating Estonian and warming up Indonesian. It looks like Clozemaster (much older actually), only less systematic and more like doing cloze deletion on a phrasebook or grammarbook. I'm merely skimming through FSI Hebrew. I wouldn't if there was transcription for the current lesson. I don't really feel like waiting for the whole set of drills to be said out loud in the recordings just so I know how each word is pronounced. If I ever get back to FSI, I might then listen to the drills in their entirety, but not now, now I could benefit from listening to the main dialog only and just reading the drills. The same was supposed to work with the Berlitz course as well, but this one lacks audio and has an incoherent transcription system. So this is how I got stuck at two unproductive Hebrew resources. I wonder if I wouldn't be learning more from double subtitles at a series. So this is the end of my first day of studies after holidays, and yet one of the last ones this year. I probably won't be studying this entire week and then there are only two full study weeks until Christmas. I have been reading the forum a lot during my vacation. Still far from catching up, but good to alternate with my meager Clozemaster sessions. I'm been rethinking my learning strategies - or lack of - up and down again several times the past days. Sometimes I wonder if I'm not doing nearly everything wrong. There are different paths I might follow next year according to which meaning I want language learning to have in my life, work and leisure comprised, and I want to keep reflecting upon this. Probably it will help to put some ideas on paper, like the opening posts for my next year's log, for instance. I had the evening off but I did very little Clozemaster again. It works better when I do it little by little during the day, alternating with other tasks. Yesterday I was behind schedule so I hope it's better today. I'm planning on adding some grammar challenges but nothing regular for the time being. Finished the French comedy Qu'est-ce qu'on a fait au bon dieu ? . It's a good one, funny and dealing with stereotypes with a light humor. Now, l'aile ou les cuisses. Still a long way to go at my personal film list, but then I believe it's doing great to my listening skills to keep doing films at this level instead of sticking to one series. I'm dying to watch some series as well, but I have no time as of now. I've been collecting a lot of C1 resources for my strongest languages, English, French and German. I wonder if I should open them. They're meant for classroom use. Being behind schedule, I'm just reading Estonian in parallel instead of pasting it on pastebin and hovering over unknown words (which is more intensively). I'm much more successful at linking Estonian word and translation now, though. so the task is turning out pretty much productive. The word for business, thing is საქმე (sakme) in Georgian. In Hebrew, it apparently עֵסֶק (asak), and I wonder if they are related through Arabic and through which Arabic word. Finally finished my tasks a bit earlier, enough to play with Clozemaster a bit more. Tomorrow might be busier, and the next two days I won't be studying anyway. Yesterday I managed up to Indonesian on Clozemaster. Only the text input round for the stronger languages and the Icelandic were left undone. I'm really looking forward to bringing my Icelandic up to my Czech and Finnish level, which is a remarkable jump from what one can understand thanks to a similar langugage (Russian; Estonian), and represents a solid headstart if I ever move these languages up from the dabbling status. I've received a Welcome to Pro email, and replied to it pointing out once again my review/score issues, but no answer so far. This is one reason that makes me rethink my pro membership. I have the first month to decide if I want full refunding. The progress is slow, but I'm noticing some increase in comprehension after listening to the Estonian soap opera without subtitles. I can't read Estonian, far from that, so I'm actually missing the subtitles and the machine-translated English ones. So it's not simply a matter of training listening skills. Even so, I'm noticing progress in my overall comprehension, which is very encouraging. I was writing some instructions to a student and it got me thinking about the ultra-soft imperative with "pode" (you can, you may). It's in between a commandment, an order and a suggestion, and it's meant to avoid any patronizing tone (though depending on the tone it has the most autoritary effect instead). - Pode ir ajeitando as cadeiras, eu já estou chegando para a reunião. - Aqui está o material. Pode ir dando uma olhada, na próxima aula a gente vai discutir o tópico tal (this is close to what I wrote). An interesting formula learned today, sejak kapan (since when) in Indonesian. Fnal day of studies this week. Hope all goes well tomorrow. I could barely skim through the Hebrew lessons, but at least I'm close to finishing both resources. Back at studying. Three weeks to go, which gives roughly 15 days, but I expect to spend 2 days on translation and leave 1 day earlier. So we can count 12 or even fewer days. Enough to finish at least one of my current two Hebrew resources, I hope, which is what worries me the most. I basically don't need to look up words individually anymore in Estonian. I can make sense of the sentences and link word-by-word to the translation. That means I may also increase my daily quota to 2 pages instead of only one. Time is a constraint now. Still busier than usual. Not much time for Clozemaster, I can barely make it to Hebrew these days. The German novel I'm listening/reading in parallel has been a bit less interesting the latest days. At least I'm keeping my progress in reading and increasing my fluency. I'm having more trouble with the German non-fiction which I'm reading extensively, but I'm managing it so far. Today I had more time left so I pasted the Estonian text online for looking it up with the GT add-on. It was practically unnecessary, which shows that my skills have improved. Greek listening-reading has been very productive. It feels almost like a Romance language where I can transfer words continually into my active skills. I feel less repentance for not giving the language the attention it deserves, for not improving it at a faster pace which I would still manage to without burning out. Finally finished actually earlier. I still need to get back to a layout where I do shorter but productive lessons in Hebrew. Meanwhile, I'll try to do more Clozemaster done than in the past days. Yesterday I managed the full Clozemaster set. I think I'm repeating too many words on the larger decks at the text input rounds. It takes several months to even have all the words within a deck as read, leave alone mastered, in the case of German, Mandarin and Russian. Harry Hole's novel in Mandarin is coming to an end and so I'm focusing on the story, even if that means not paying much attention to text and only vaguely to audio in Mandarin. I promise I'll pay more attention when I start the next one, Dan Brown's second most recent novel. So I finished my first more-or-less classical novel/audiobook in Italian: Le meraviglia del Duemila, by Emilio Salgari. I liked the story but not so much. The anacronisms and the not-so-successful futurism exercise are blatant. And since the language is old, the dialogs sound like formal, written language. Not an obstacle for a Romance native, because the more literary you go, the more the languages tend to converge. Not what I'm looking forward to, though. I got caught off-guard by starting Metro 2033: the audiobook I had prepared so soigneusement is actually in Spanish! I'm reading two other books in Spanish now, so I won't start this translation from Russian. That leaves me with finding something in Italian.I got a couple of classics from Librivox which I might get back to later, but I ended up buying something from Emons. There's not much available at their catalog, even less once you discard the translations. Usually one single novel from each author and not their most famous one. Next time I might check on Audible where I can still buy single audiobooks, like the second volume of Il mercante di libri maledetti. Still not worth a regular subscription to Audible anyway, I might take over one month on each book. Reading in Georgian has been taking less and less effort; dubbed subtitles start to sound really transparent and I start to anticipate translations after reading the subtitles right before. 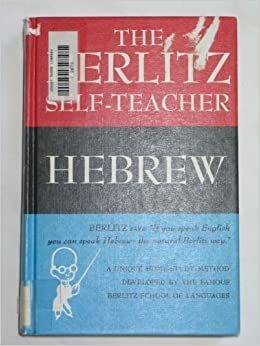 It might get good towards the end, or at least so it is with Berlitz Hebrew. I'm getting used to the words, also seeing them on FSI hebrew, Both have very long dialogs which makes them rather meaningful. I'm almost used to Berlitz' transcription, just not enough. A second read through the book later on, when I'm familiarized with the script, might come in handy. I'm a bit more hopeful about Hebrew and Indonesian. Some words start to stick. I'm looking forward to a more consistent study year. I could be doing more each day for either language, specially Indonesian, but time is a constraint. And yet I'm consolidating the basic vocabulary instead of just moving on frenzily through longer and longer textbooks. At this point, watching series, even if just reading subtitles in the case of Indonesian, could have proven very helpful. I need to check my priorities for next year. I have something in mind for Hebrew: given the scarcity of "proper" learning materials with both transcript and translation, I'm planning of keeping aside my most often used materials that are long and almost pre-intermediate and just keep reviewing them as a separate resource while I keep moving on through new resources such as grammar references, native materials and the odd intermediate textbook I manage to use. FSI's thoroughfulness keeps surprising me. It's a reference work, more than a textbook. I'll definitely come back to it for perfecting some topics even if I can't do the drills. I see myself visiting Israel one day. At the Argentinian podcast, I listened to an interview with a Cuban and had a hard time with is accent. Besides the a'o participle, it also seemed as though he had vowel reduction. I'm discussing guaraní with another Brazilian polyglot. He says that he found it easier to study Tupi (Nheengatu) from a Brazilian author and then address Guaraní with a solid grammar background. The alternative is buying better grammars from Paraguay, which isn't something intuitive to find and Guaraní is taught there rather as native language. Even the Spanish-based resources for Paraguayan Guaraní are fairly limited. Imagine that you want to study Occitan and you have Occitan in 3 months. And then you have Assimil Catalan. Plus a Routledge Grammar on Aranese. That's the spirit and the dilemma. I'm still tempted to go for Paraguayan Guaraní anyway. Not the time for delving into languages of Brazil yet. Anyway. time to put an end to this collector's trip. Starting to understand more from the Estonian soap opera. I expect to see a boost in comprehension when I resume using subtitles. I started listening to my newly purchased Italian audiobook, Mi piaci da morire. Yes, chick lit, which couldn't be more useful for learning daily conversation. The narrator describes her daily activities and feelings with a vocabulary that would please the fiercest CEFR examiner for the B2 stage. Much better than high brow literature for that matter. I was caught off-guard by the conclusion of this book at lesson 34, as I was assuming it would last till lesson 40. That's just a detail, as there is a lot of content in those 34 lessons. It works more like a graded reader centered around dialogues. All lessons have transcription and translation; the earlier ones are dotted. I'd have preferred to keep going with the dots instead of the awkward transcription system, similar to the one I find in my (not-so-old) Berlitz Italian and German books which I didn't make a good use of thanks to its format. That is to say, this format wasn't enough for me to learn German or Italian, as when I got them I didn't even know how to use such material and was expecting it to evolve like a normal textbook. This Hebrew one, though, is worth checking. I plan to get back to it later, when I'm more familiarized with transcription, for consolidating dialog and even activating some sentences. In the case of Hebrew, we can't really disregard any resources with transcription (clumsy as it is) or translation. Now the time has come to make good use of my newly-acquired German fluency and finally do Langenscheidt . Fingers crossed. Hope I don't get stuck due to lack of transcription or translation. On a side-note, I'll start studying from the method that needs special fonts to work and which I can only study from at home, in parallel. At Side om Side I heard the verb "nøster", "Da nøster vi opp i det". I knew that Norwegian had tusenvis of synonyms to "tired", but not to "looking forward to" - gleder meg til, ser frem til, now that nøster, and counting. Guaraní has a fairly phonetic spelling, so after the videos I'll be watching on Youtube I won't find it much trouble to study from textbooks with audio. I have full-time support from native speakers after all. I need to take advantage of this opportunity. So, now I'm officially dabbling in Guarani. I started saving on a folder the translations a guy posts at the Whatsapp group. That guys translates mostly internet memes, which consist of very lively language. The reader at Langenscheidt uses the alveolar flap/trill for the 'r' instead of the fricative I'm more used to, which I'll keep adopting anyway. I like the book so far. Pity that I don't have the answer keys, which makes the exercises practically useless. Another Indonesianpod101 level is over and again comes the struggle to find the next best material. For the time being, I'm sticking to the next level, Beginner. The mere reason I'm reflecting first is that those divisions within pod101 are not so much intuitive. Actually, there's a jump in dialog/sentence length from the Lower Beginner to the Beginner levels, but from what I could infer the Beginner level will make use of several abstract nouns and prefixed verbs that I keep seeing on Clozemaster, so I expect some synergy to happen. My dabbling in Guarani consists of a single 3-minute TY video and two rounds of Duolingo (which adresses rather the Jopará). I'm looking forward to Duolingo Jopará while I'm rather lazy about languages I'm already studying from other sources. That means that only novelty and the scarcity of resources might motivate me to use Duolingo, i.e. when I have to resort to it as my main resource. Today I gathered many more resources. I think that at least the A1 stage won't be a problem, and the challenge will be rather to keep improving later> I plan to ask around on the WP group rather often. Expugnator wrote: At Side om Side I heard the verb "nøster", "Da nøster vi opp i det". I knew that Norwegian had tusenvis of synonyms to "tired", but not to "looking forward to" - gleder meg til, ser frem til, now that nøster, and counting. I won't insist on anything without knowing the context, but normally, I would say that "nøste opp" means to figure something out or sort it out.